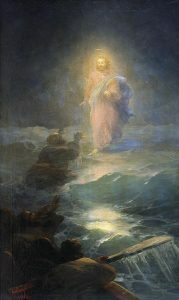 Jesus appears to the disciples in an unexpected and supernatural way. How often does this happen to us? How often do we see Jesus in unexpected, if not supernatural ways? We certainly encounter Him in the mass, but do we recognize Him throughout our day? Do we recognize that the people we encounter daily are created in His image and likeness? Or do we rush throughout our day—not necessarily ignoring Him, but not having the patience to see what is right in front of us? Additionally, how many coincidences occur in our lives of which we take no heed? Does not Our Lord have ultimate control over all? Do not all good things stem from Him? Is He not always acting in our lives? What coincidences, whether big or small, have occurred for us recently? Now the disciples were afraid when they saw the Lord, and that reaction makes sense! However, when they received reassurance, they acted rightly in accepting the Lord. We need to be careful in our encounters, especially with others, but once we are reassured, do we embrace acting in the correct way? The disciples were also disoriented by what happened. They totally lost track of their location on the water. Our Lord has this disorienting quality. When we truly let Him in, he will disorient us. Just going through the motions with our faith is particularly dangerous. Obviously desolation is also negative, but the lukewarm middle ground can give us a false sense of comfort. The state of comfort is troubling as it makes it very difficult to discern how the Lord is working or how we are being attacked. If anything, these are times we want to commit to Our Lord, the sacraments, and prayer in deeper ways. Take time in prayer today to think about our daily schedules. Who do you interact with each day? Who do you see, but perhaps not think about? Make an effort to be kind to this person, and to treat them in a way that is truly reflective of their inherent dignity. Today try to reflect on your weekly journey for 10 min.